Last night, at Mt Field, we finished off our enjoyable time there by having a fire BBQ in the Day Use Area. It was great to have a wood fire, overlooking the Tyenna River. While there, we looked across to a large flat area, possibly previously used for for camp sites, and we saw an Echidna. We went over and were able to stand within a few inches from him. He had food on his mind and nothing was going to stop him. Arrived in time for the 12 o’clock ferry for Bruny Island, after mistakenly taking the bridge over the Derwent, causing us to manoeuvre a U-turn and a return trip over the bridge, so we could head south to the ferry. 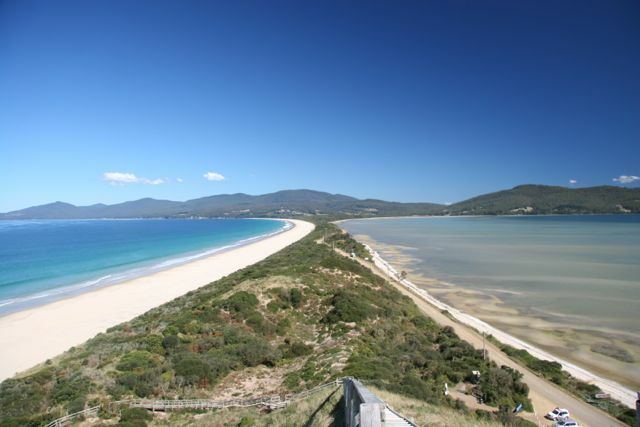 The ferry trip only took 15 mins to Bruny (once written as Bruni, with much debate now about whether or not the spelling should have been changed). On the way to the caravan park, we bought two dozen local oysters. 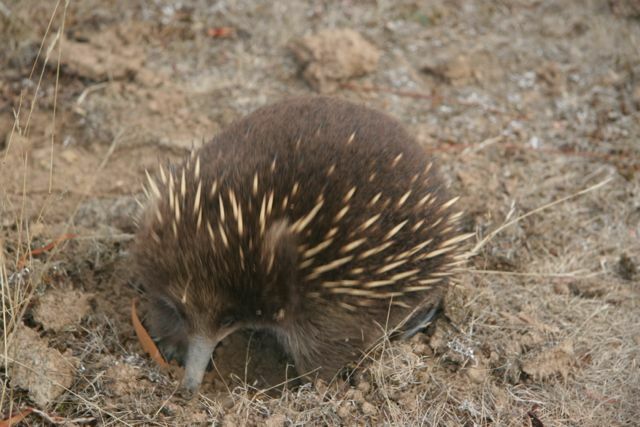 First impressions were of dry eucalypt forest, with some cleared areas for farming, long and winding roads – again – large mountains and beautiful seas. Drove to Adventure Bay and we were very happy to have a sea-front site, although the council is building a bike path, so instead of hearing the beach, we hear the reversing alert of the bobcat. Never mind, the scenery and our site are great. We had one dozen oysters mornay for tea – fresh and delicious. The next day we made up hamburgers for our lunch and set off to see the island. The island is divided into two sections – North Bruny and South Bruny. 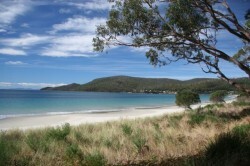 Adventure Bay is in South Bruny. The islands are connected by an isthmus, known as The Neck. There is a penguin rookery at The Neck and a viewing area, which Russ climbed to get this photograph. We then drove on to Alonnah and Lunawanna, all the time looking for a BBQ to cook our lunch, but to no avail. 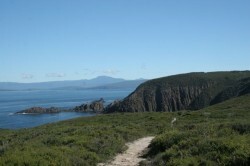 We ended up at the Cape Bruny Lighthouse, after checking out the camping area at Jetty Beach. 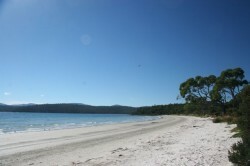 Another magnificent beach, white sands and gently lapping water. The campground allowed fires, but prohibited the collection of wood. Looks like no lunch today! Cape Bruny didn’t disappoint, with views of Mabel Bay, on the drive in, and Quiet Bay, which Russ was able to capture on film when he walked some of the way to the lighthouse. So, what were we to do? We just happened to pass a Winery with a Bar/Grill sign and advertising platters!! Yes, couldn’t resist and ended up with an oaked chardonnay with a Bruny platter, consisting of 2 oysters each, 2 pieces of smoked salmon, 2 slices of cheddar and 2 slices of brie, all locally produced, with cherry relish and olives, croutons and water crackers. Froze the hamburgers when we got home! We have enjoyed Bruny Island, the weather has been great, except for rain today, but the sun is out again so it looks like BBQ hamburgers for tea. 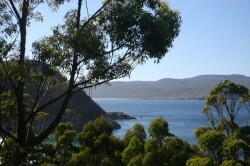 Off to Hobart tomorrow and then up the East Coast.